Peak moving season here in Loveland is slowing down as we head into fall, but we know there are plenty of students and professionals still settling in. Moving can be a stressful time, and BlackJack Pizza is here to help. Read on to learn why you should celebrate your move with a pizza, and explore our menu to find something to satisfy those cravings! Our delivery crew is ready when you are. Maybe you are sitting in an empty apartment waiting for the moving truck to arrive, and you forgot to plan for lunch. Maybe you moved into your new place days ago, and you still can’t find the all-important “OPEN FIRST” box with all of your plates and silverware. Don’t worry — call BlackJack! Pizza is the perfect solution. You can eat it right out of the box (we won’t tell anyone) or on the paper plates you bought out of desperation. No silverware needed! If paying for professional movers was a little beyond your budget, you probably depended on your friends to help you get all your boxes from Point A to Point B. It’s not free labor, however. At least, it isn’t if you want to stay friends. Pay them back with BlackJack pizza and salads! You can find something everyone will like off of our menu, whether you want to create your own pizza or you want to try some calzones and wings. We also have plenty of options for your friends with food sensitivities or limited diets! You can pile on veggies like mushrooms, onions, and olives for friends who don’t eat meat. Have a friend or two who avoid eat gluten? Try BlackJack’s gluten-free crust! The people who hauled your old couch up two flights of stairs deserve more than an I.O.U. and the versatility of BlackJack’s menu means you can find something that all your friends can enjoy. Order delivery from BlackJack and you might have a few volunteers for the next time you move! As we mentioned, moving is stressful. Your to-do list never seems to end, from cleaning your old place in the name of that security deposit to unpacking the boxes that seem to repopulate overnight. Take it one step at a time and celebrate your victories, no matter how small, with delicious pizza from BlackJack in Loveland! It’s one of the great American comfort foods, and you can find everything you need on BlackJack’s menu, from salad to dessert. Finally found all the cables you needed to install your TV and cable box? Reward yourself with our deep dish cheese bread. Went grocery shopping for the first time since moving? Take a break with our CinnaBread and ice cream. Moving can be both physically and mentally exhausting, and making dinner can feel like just one more chore. You should be enjoying your new home, not fighting with a new oven. Make it easy by ordering something delicious from BlackJack Pizza in Loveland! You can find coupons and specials on our website for whatever you’re craving, and our team is ready to deliver it right to your door. 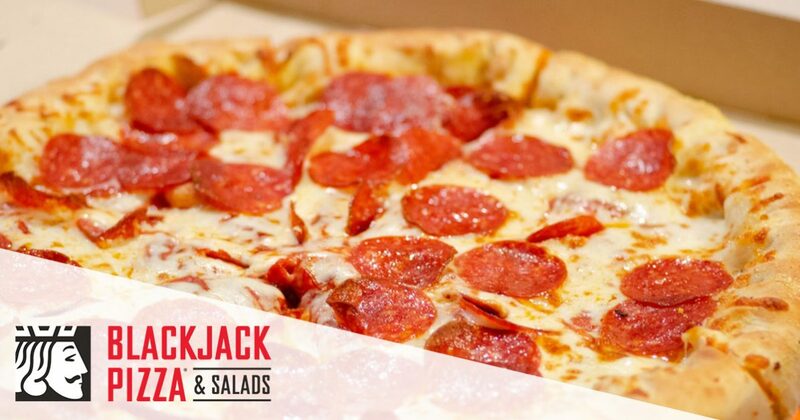 Worry about unpacking tomorrow and enjoy BlackJack pizza tonight. Order now!